Plot. Income: 4. Initiative: 0. Claim: 1. Reserve: 7. Plot deck limit: 2. 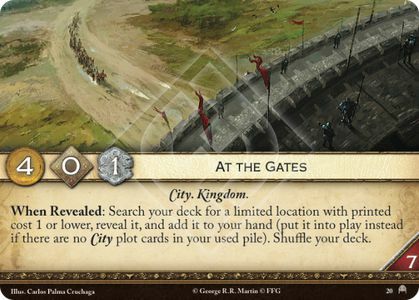 When Revealed: Search your deck for a limited location with printed cost 1 or lower, reveal it, and add it to your hand (put it into play instead if there are no City plot cards in your used pile). Shuffle your deck.